Search for and open the customer/supplier record. Select the bank account . Enter the payment date . Enter a payment reference . If a customer sends a single payment to cover multiple invoices you will need to receipt a single payment to create the accounting (so that is matches up with your bank reconciliation) but also marks each invoice as paid. This is done by receipting the payment against the invoices outstanding on the customer account, rather than directly on an individual invoice. Invoices may also be part paid by entering the amount that was paid instead of the full amount of the invoice. Where this occurs the rest of the invoice value will remain on the customer account to be paid at a later date. Navigate to the Payment allocation screen on the contact account. You can find the Allocate payment link in the Accounting mini tab for the contact, or in the Financials information box within their record. All the outstanding transactions for the contact will be displayed. Select the bank account the transaction should be recorded in. Enter a payment reference (e.g. statement number, card auth code). Specify how much has been paid against each invoice in the To pay now field; use the pay in full button to enter the full amount automatically. You can enter a part payment if required. 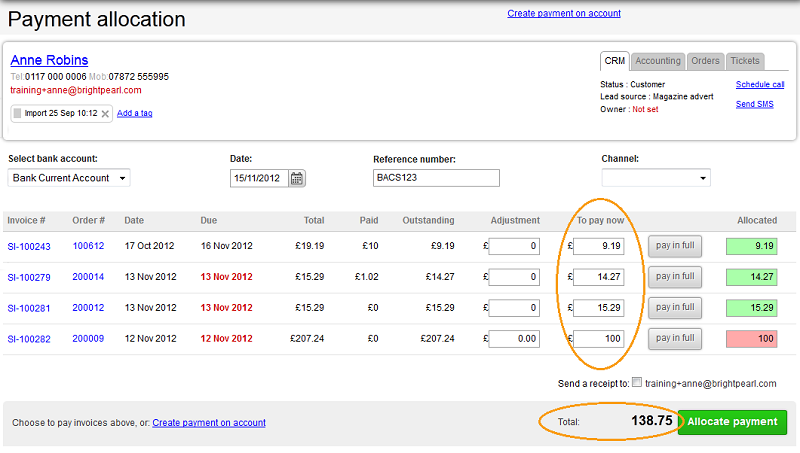 Ensure the total at the bottom of the list matches exactly with the payment amount visible in the bank account. It is very important to ensure you enter the exact amount actually paid or received so that your accounting matches your real bank account. Select the checkbox to email a receipt/remittance. 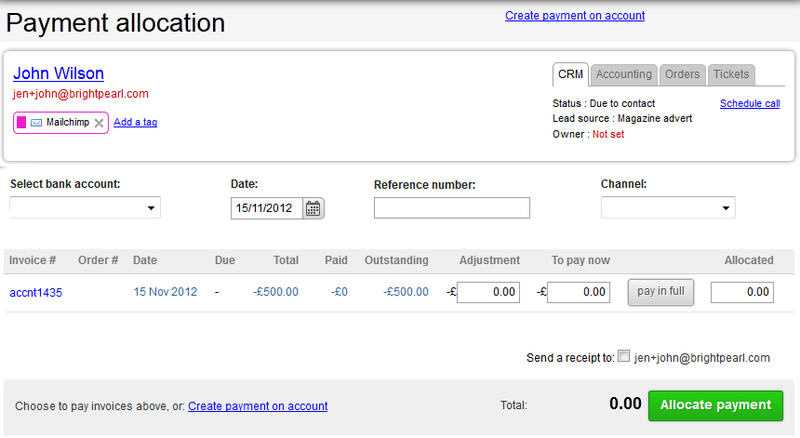 The invoices paid in full will automatically be cleared from the contact's outstanding balance and no longer listed. Invoices with a remaining balance will stay on the account, indicating how much has been paid so far and how much is left to pay. 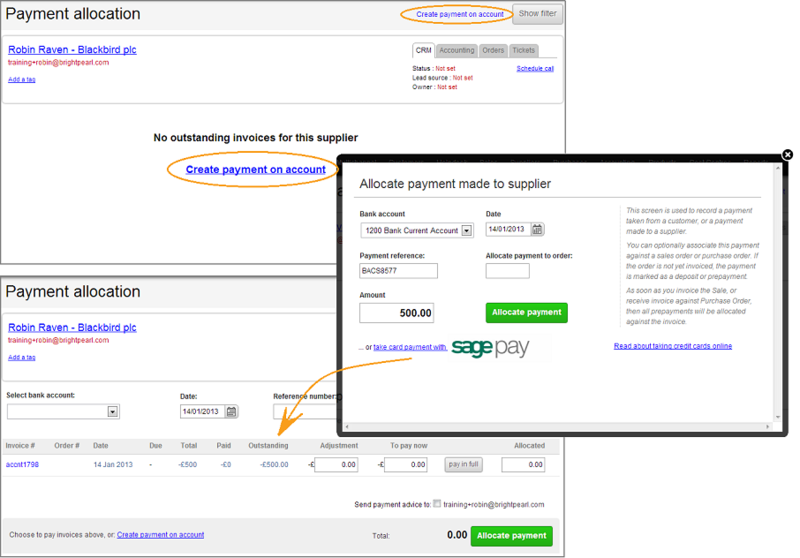 Click the Allocate payment link in the Financials information box. Click the Create on account payment link. If there are any existing outstanding items they will be listed, so the link can be found at the top of the screen or below the list of items. Enter the payment details into the displayed window, but enter no order number. The payment will be displayed on the Payment allocation screen and the accounting created. The payment will remain on the contact's account and can be allocated to invoices at a later date.